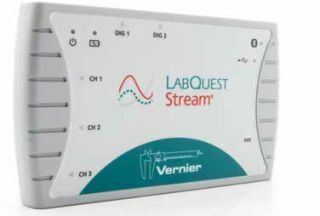 The Vernier LabQuest Stream is a Bluetooth wireless/USB sensor interface that allows students to collect data from a variety of Vernier sensors. Students and teachers can utilize mobile devices, tablets, laptops, and Chromebooks to collect and analyze sensor data using Vernier’s software and apps. Ease of Use: Set-up is straightforward. Users simply launch the data collection software/app, turn on the Stream, and either plug it into a computer via USB or connect to a mobile device via Bluetooth using the tools found in the app. Each Stream has a unique serial number clearly printed on the back of the device to allow for easy identification when selecting it in your Bluetooth settings. And students can connect to any Stream in the classroom that is powered on, allowing for wireless data collection. Users then start their experiment and begin collecting data. The Stream automatically recognizes the type of sensor and also allows for customizing how the data is presented. It can handle up to 10,000 samples per second when connected wirelessly and 100,000 samples per second via USB. Creative Use of Technology: The LabQuest Stream is an elegant and straightforward solution that facilitates a variety of activities involving sensors and data-logging. The Bluetooth wireless connectivity makes it even more valuable since it does not need to connect to a network and so is not affected by limited or restricted bandwidth. Furthermore, it fits right in with BYOD and 1:1 programs since students can connect their mobile devices to collect data wirelessly using their free apps. Suitability for Use in a School Environment: The LabQuest Stream is a professional-grade device at a price that fits a school’s budget. Its user-friendly operation and powerful data analysis software make it a great fit for a school environment. The software is easy to use and allows students to collect, analyze, and share sensor data. With real-time graphing and analysis, students can predict, annotate, and analyze their data in a variety of ways. The software also allows the data to be saved and exported for use in other programs or presentations. The Vernier LabQuest Stream is an excellent device that extends and enhances learning in any classroom that uses, or wants to start using, Vernier’s vast array of sensors. • It’s easy to set up and connect a variety of devices and operating systems. • Enables users to connect multiple analog and digital sensors on each device. • Powerful data-logging and analysis software is free to download on Mac, PC, Chromebook, iOS, and Android devices.